Today was Gabbys first day back for treatment since she left the hospital. Tomorrow is her first day at the clinic. Not sure what that means exactly but I’m sure we will find out tomorrow. The last few days back haven’t been easy for Gabby, for some reason we thought she would open back up. Unfortunately that hasn’t happened yet. This morning at CHOP I told Carolynn all I want to write is, “I’m scared all the time”. Nothing else, no quotes, no humor to keep it light, just those five words. From the moment I wake up to the minute I pass out. I’m scared all the time. Scared she won’t walk again by herself, scared she won’t run, scared she won’t talk so others can understand her, scared that the pain in her right eye and the redness isn’t some other horrible new symptom of this disease. I keep telling myself she will get better, this will all pass, the hair loss doesn’t matter and in no time I’ll hear her real laugh again. But then I see the three inch scar on the back off her neck and lower head from the biopsy, then I look at the scar where they put the port in. Lets not forget the fact that I can now see the rib cage on what used to be a little girl who didn’t lose her baby fat yet. I think all this and then I think, I’m ashamed. What right do I have to be afraid. She is the little girl trapped in her own head. Just so you all understand, Gabby is thinking clearly, it’s just her body won’t do what her brain is telling it to do. She sits up and wants to get off the couch, but her legs don’t know how far to move, or which one to put down first. She has always loved to color and do crafts. In the hospital during therapy the therapists had her color and paint. After they were done, they would ask her if she would like to keep the pictures, she always said no, they asked if she wanted to give them to someone, she said no. She said to throw them away. She would never say this before, she and we saved everything. But it comes down to now her signature is a scribble of lines as well as anything she tries to color. She can’t use her fingers to pick things up. The left hand can push things around, the right one she has more control over. To look at her you know she is in pain. She’s frustrated because she knows this isn’t right, she just can’t do anything right now to make it better. So I’m ashamed, I read the comments on facebook, about how brave, and how strong people think I am. How much heart and courage I have. All I want to do is scream no, that’s not true, I’m scared and afraid 24 hrs a day. I want to yell it’s not courage it’s a lack of choice. My birthday is tomorrow I’ll be 38 Gabby will still be 5. However she is the strong one, she is the brave one, and she is courageous, I’m just the guy pretending till she falls asleep. Each day has been a struggle to get her to eat something , anything at all. For the last nine years of all my children’s lives we have tried to do the right thing. Television isn’t watched much. Maybe ½ hour to an hour per day. Fast food was always a reward not a daily or weekly occurrence. Now things have changed for the Gabster. A healthy diet isn’t what we need right now. Basically we are trying to do anything and everything to get her to eat. She lost over two pounds since Saturday. Remember this is a 50 lb girl. 2 pounds is a big deal, I’m not sure how much she has lost in total but I would have to say at least 13-15lbs. I’m sure this will be a discussion tomorrow during our clinic visit. Today during radiation a nurse kept calling her pumpkin pie. Something struck a cord with her. She said that’s what she wanted. So this afternoon I made a mad dash looking for pumpkin pie, not only did I find it, I also got the stuff for Carolynn to make homemade pumpkin pie with extra calories. 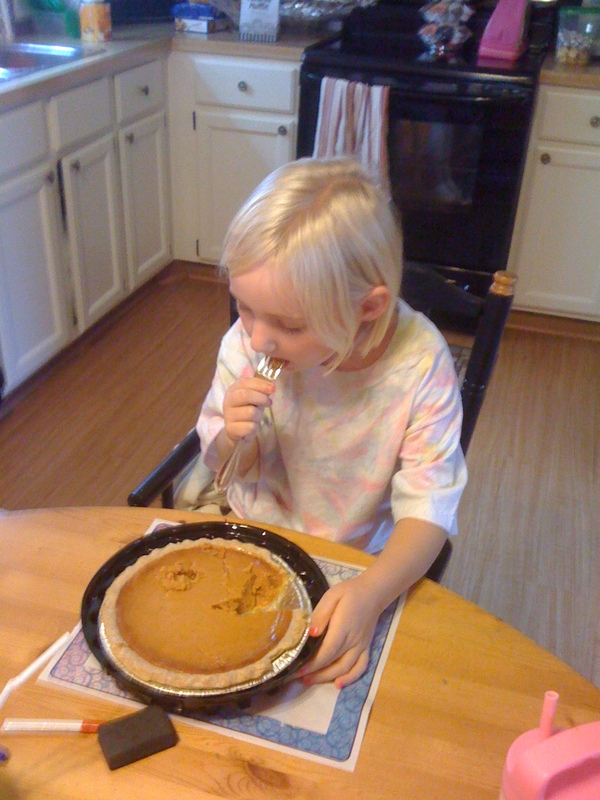 Gabby ate pie for lunch and dinner. Yesterday I managed to get her to eat three Oreo cookies after they were soaked in milk. The tumor effects her chewing and swallowing. She pockets the food and most times either Carolynn or I have to use our fingers to scrape most of the food out of her mouth. This is why things that are soft and basically melt work. We aren’t worried about healthy now we are worried about getting her to eat more calories. She doesn’t like Pediasure, won’t eat pudding or applesauce and it seems has now moved away from Frosted Miniwheats. When they are babies you give them formula and they eat it. When they are five, stubborn, and can’t swallow it’s trickier. I made her a black and white milkshake today, loaded it up with vanilla ice cream and lots of chocolate syrup. She probably drank a ¼ of a cup. We were hoping she would drink it all. But at least it’s something. Tomorrow we will try again, the issue is she can’t really come up with something she likes because I’m not sure she knows what she likes. The smell of food cooking bothers her and she seems to not like most of the things she used to. She fed her sister cheese balls and laughed as she kept stuffing them in her mouth and moved onto stuffing them in her shirt when her mouth was full. She laid on me as just her and I watched TV today. She Secretly told Carolynn to buy me Junior Mints for my birthday. She ate Pumpkin Pie and loved it! I keep asking Gabs to say I love you daddy. For some reason I recorded her saying it the day before her biopsy June 2nd. And since then she hasn’t said it. I told her I want it for my birthday. She just said she’ll say it when she is better. Just another sign my stubborn little girl is in there. Refusing to do something until it’s on her terms. That’s okay though, I’ll wait and it will make it that much more special. I’ll wait for my little girl while she tries to break out from the jail she is trapped in. Like I said she is strong, she is brave, and she is courageous. Most importantly she Believes. Even though I have 2 young grand children, Gabby comes into my dreams alot. Last night was a special one for sure – GOD is looking out for her! I’m so sorry for all Gabby & your family are going through. I know it sounds so odd to have people tell you that you are brave, but you are bc you have the choice to sink within yourself and succumb to the despair and pain you are feeling which would cause you not to be the dad that she needs you to be, or to find that strength within to break through that so you can do all you can for Gabby. Just be confident that when you feel you have no strength left and cannot possibly handle one more thing the strength will come from somewhere! I have learned that acceptance is a journey. And people who have never had their lives turned upside down by a medical diagnosis for their child can’t possibly even begin to understand the depths and layers the term “acceptance” holds. From one parent of a child with medical diagnosis to another my advice would be to please not worry about acceptance because there will always be something you need to “accept” and the journey to accepting each layer of the word is at times excruciating but it’s what will keep pushing you forward. I have always said I would not wish diagnosis on my worst enemy as there are truly no words to describe what it is like as you adjust to your new “normal”. My heart breaks for Gabby and your family not only for her diagnosis but for the trauma of having your lives forever changed. My son had a massive stroke and does not have cancer, but we all belong to the same club that we never asked nor wanted to belong to and once you experience that depth of pain at diagnosis your heart will always hurt more when you hear stories. Gabby and your daughters are so lucky to have such wonderful parents, praying for your family as you continue your journey! I read what you wrote this morning.. My son was diagnosed two years ago with severe All leukemia… There wasn’t a second that went by that i wasn’t sick to my stomach wondering when will this all end.. Everyone called me brave. I was just doing what any other parent would do in the same situation.> You can’t run.. you just have to be brave for your child. If they see that you are afraid they get scared. I would just cry by myself sometimes and that would help.. I also had a ton of support which also helped. If gabby is stubborn that means she is still there and doing great.. Keep making her laugh and giving her those milkshakes..add some peanut butter… or anything with guacomole helps.. that extra good fat… Austin was 29 pounds at age 4…he was so skinny.. i remember trying to feed him everything and anything.. i was so tired.. Get sleep!!! and switch off with mom…. Feel good and I will say lots of prayers for Gabby. John, The Bravest men all are scared, the difference is overcoming the fear and doing what needs to be done. What you are doing makes you one of the bravest of them all. Have the Best Birthday possible. You and your family are in all our thoughts. Unfortunately, there are no words that I (or anyone else for that matter) can say to make anything better for your family right now. But, please know that so so so so so many people are praying for you & thinking about you at all times throughout the day. God bless tonight & always. I think of Gabby a lot a lot a lot. I feel her and her family’s pain, hope and fear. love and warmth of family and friends is the best way to heal Gabby. 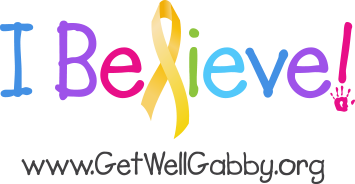 I might just be 9 but I now what hope, love, fear, courage, and family and friends can do to someone hurt like Gabby. we hope every Penny helps you girl Gabby. The words I said is for you to know someone cares and wants to help very badly. Get Well Gabby!! I well always hope for Gabby Vogel! My thoughts nd prayers are w/ ur family. I was wondering if you had talked to anybody at Sloan Kettering in NYC? They do amazing things there nd it might be worth giving them a call. I believe in the power of positive thinking nd as hard as it is right now to find any positive in all of this remember that Gabby is strong nd, as you said, stubborn. That in itself is most definitely a positive. God Bless you all. Gabby. Your beautiful girl is in my prayers every night. John, It’s ok to be scared. Your family has been rocked and no one evere is prepared for that kind of thing. Believe that the angles are looking out for Gabby and she will pull through this and be a healthy little girl once again. Don’t take your eyes off that end. Continued prayers and positive energy!! John as far as I’m concerned you are one of the bravest men I’ve ever met. You don’t hesitate to tell everyone how you feel and what your going through. You have every right to be afraid and to cry, scream and kick if you need to. Gabby does see you as her hero and I BELIEVE she WILL say “I Love you Daddy” when she’s ready. God Bless you, Carolynn and the girls. I pray everyday for all of you.